Support the 9 Reykjavik and COP15 Activists! Khimki victory: Maxim Solopov released! What conclusions can than be drawn about the left after Copenhagen? One way is to avoid assessing what happened and opt for next summit or localized actions. 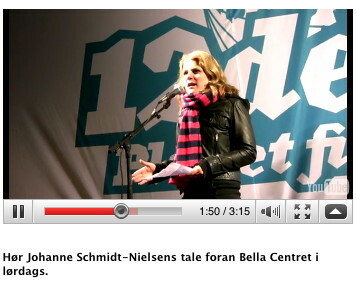 Johanne Schmidt-Nielsen speaking for the Red Green Alliance at the Bella center during the 12 December march. Meanwhile other members of her party issued press statements supporting a police perspective on the repression against the demonstration or claimed that the demonstration organizers are unwilling to respond to the state aggression. At the same time more than 900 participants in the demonstration are mass arrested and forced to the ground. The show must go on? Videoshot from Red Green Alliance climate campaign web site. But what happened in Copenhagen is that a political process normally invisible or very hard to see became evident. Both inside and outside Bella center the Danish state and its allies did what they could to establish a new global governance system. The victories in the struggles against fascism by establishing at the formal level the UN built on recognition of indivisible human rights including both social and democratic should be wiped away. A formal arrangement built on the power relations of earlier class struggles and continued social forces among the working class and peasants in different parts of the world as well as anticolonialism and emancipation of women. 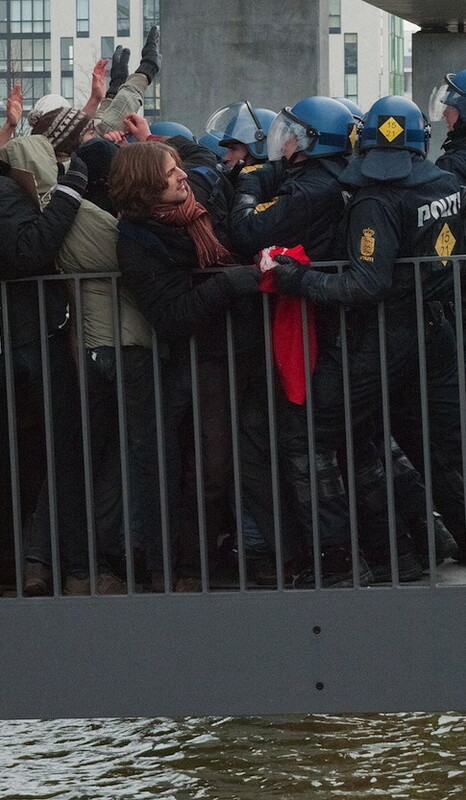 Police stop and soon violently use their batons to stop UN delegates from coming out from Bella Center to the People’s Assembly at the Reclaim Power action December 16. What the Danish government did in Copenhagen was to use all its informal power to ignore the UN and instead establish a separate global system based on an alliance of big powers excluding any idea of equal sovereign nations and social rights for everyone as guaranteed by the UN declaration of human rights. Simultaneously was also the democratic rights also guaranteed by the UN abolished on the streets of Copenhagen, in practice randomly and arbitrary against anyone. It even went so far that UN accredited delegates were beaten by Danish police as they tried to reestablish the original goal of UN and the popular movements that had struggled for the social and democratic rights by joining a People’s Assembly with movements from all over the world coming from the outside. Front banner at main demonstration 2002 with Socialist People´s Party Youth van backing up. 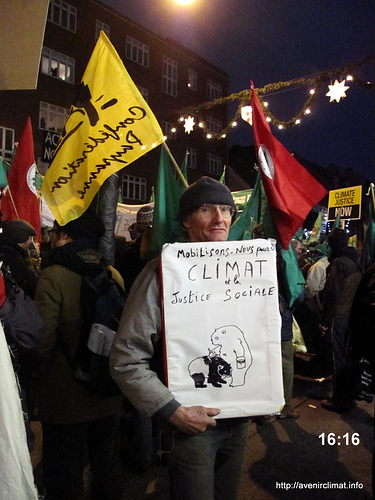 Seven years ago in Copenhagen both the Socialist People´s Party and the Red Green Alliance were out on the streets protecting the human rights. People in the Anti Fascist Action together with others initiated a civil disobedience action at the Bella center with political success. The head of the police stated when media wanted to raise expectations for violence manifested by groups like AFA being involved that the experience of the police was that an agreement with AFA was trustable. The strong involvement of the parliamentary parties against repression and the tactic of the police to avoid escalation worked quite well to protect democratic rights. The militant activists had a similar political agenda or at least not contradictory as the left wing parties and the EU-critical movements in what was labelled the global justice movement. 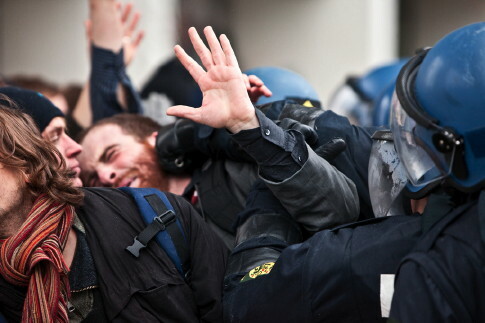 Since then social unrest is growing in Europe while the social gaps are increasing. The militant groups have split and today few would be capable or interested in making agreements with the police or for that matter sometimes other groups. The police has in Copenhagen more clear than in any other case in Western Europe been given free hands to abolish freedom of expression which is the basis of democracy. On social issues the trade unions are more and more on the defensive as well as most social forces in society. Neoliberalism have failed ideologically but is as strong as ever in practice. A common agenda against social injustice is not existing on social or environmental issues. Instead the left and NGOs are united on the issue of changing interstate relations between the North and the South on trade, debt etc. That the environmental and peasant movements tries to formulate a social revolutionary vision for the struggle demanding more power to the direct producer and challenging consumerism goes unnoticed by both the left and the trade unions, at least in the North. All these are factors of importance. But the most drastic change that has been taken place is the changed role of NGOs and the left wing parties. The NGOs chose to completely become part of the government by refusing to take part in organizing an alternative summit, the Klimaforum. The left wing parties did the same by refusing to collectively act against repression as they have the duty to do as organisers of the December 12 demonstration. In its assessment of COP15 the leader of the Socialist People’s Party Villy Søvndal comes to the conclusion that the former right wing prime minister Anders Fogh Rasmussen, now general secretary of NATO, would have done a much better job chairing the Climate Summit than his successor Løkke. This is also the opinion of most Danes according to the opinion polls. In an analysis of this opinion the liberal paper Politiken comes to the conclusion that it is false. It was Fogh that in the first place made a Danish foreign policy doctrine out of the idea to always tie Denmark more closer to the US than any other country or the EU. But the world map today makes this doctrine unrealistic according to Politiken and was the reason why Denmark failed as G77 or its most strongest powers do not accept a process totally in the interest of the US anymore. But for the Socialist People’s Party leader it is a stronger right wing minister that is the solution for how Denmark could have done it better, as the opinion polls says so. The drastic change among the left wing parties is their stronger integration in the media arena. The Socialist People’s Party becomes popular by being strong on law and order and anything that the media finds important. The Red Green Alliance have followed suit and upgraded its adoption of media values and staff while movement values and contacts have been down graded. Both parties ends by internalizing the police view on violence. What we see emerging instead of two anti neoliberal parties opposing repression is an elitist media and state oriented left integrated in a authoritarian governance model. In this model movements do not count, maybe they can send signals to the politicians if they by chance avoid getting arrested. 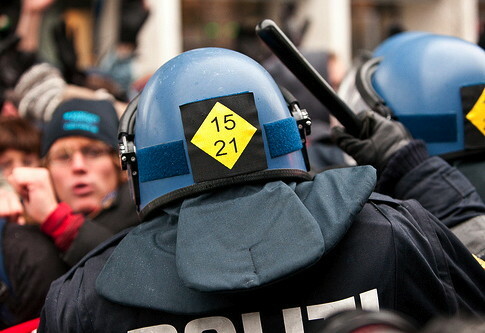 The social democratic and all other trade unions in Copenhagen protested against the hooligan law as a threat not only to climate activists but also to trade unions. This is of no concern for the Social democrats that supports the police when it is used in full scale during the summit. Why bother about what movements say when it is the parliamentary parties that have the privileged access to media and state subsidies? But in the long run the way to conflate any kind of violent or non-violent action, spokes persons and people actually acting, innocent and maybe, maybe but not necessary guilty persons into equally arbitrary objects for repression is not very sustainable. When all NGOs and the parliamentary parties have left other arenas than media and governmental power there is none left to be among the people but movements. This kind of authoritarian rule might be possible for some time but is too costly in the long run. It is also sometimes to visible as during the Climate summit. The simple question to ask the left wing parties and all formal Danish organizations involved in the responsibility of inviting people to mass activities during COP15: We need an explanation and a democratic decision in consensus or if necessary a majority decision of how you refused to answer collectively on the Danish state and its degrading treatment of almost 2 000 people. After all it was not only a domestic problem but of importance for all humanity and may if Danish organisations do not react collectively spread also to other countries. Danish organisations are accountable to people from other countries that went to Copenhagen as we live on the same planet as well as towards all Danes that were badly treated and the future of democracy. Why is the left promoting police perspectives? 12 December Initiative – huge success or background for branding?